Use 16 ounces to every 240 gallons of diesel fuel. Use 16 ounces to every 120 gallons of diesel fuel. The best all-around diesel fuel performance additive, DIESEL AID + CETANE protects critical fuel system parts while improving power. 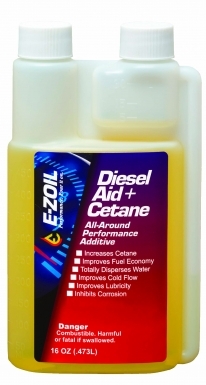 DIESEL AID + CETANE emulsifies water to prevent fuel system failure, increases cetane up to 7 points, increases lubricity, improves cold flow, and cleans your fuel system. For maximum diesel power, reach for DIESEL AID + CETANE!